If you dig the idea of The Talos Principle but don't really have a solid handle on what it's actually all about, the "Public Test" release that hit Steam today might be just what you need. It features four complete puzzle levels of increasing difficulty plus a benchmark tool, and it's completely free. 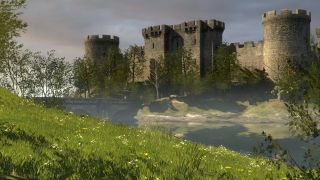 The idea is to provide stress and compatibility testing prior to the full release of The Talos Principle, but it should also help gamers decide whether or not this is the sort of thing they want to throw their money at. Given the relative vagueness of the premise, after all, this really is a game that's well-served by a demo. Believe it or not, the artificial intelligence referred to in the trailer is actually a real thing. The game underwent roughly 15,000 hours of playtesting at the virtual hands of a bot, which the studio created and used to check for flaws in level designs that could make them impossible to complete. The bot watches a human complete a level once, then uses the logic of the solution to work through changes in level geometry, obstacles, and placement of puzzle objects. "The bot replicates the gameplay played by human and uses game mechanics to solve puzzles, just like a human player would. When the bot notices a problem, it automatically reports a bug using our in-game bug reporting system, then uses cheats to move on and continues testing further," Croteam Chief Technology Officer Alen Ladavac told VentureBeat. "Thus, in one 'playthrough,' the bot can report several possibly game-breaking bugs and give us a report of overall health of the game as it is in that moment." The Talos Principle public test is available now from Steam. The full version The Talos Principle, which will include more than 120 puzzles in total, comes out on December 11.